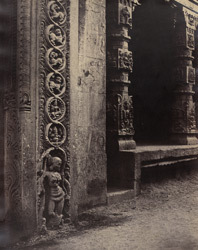 This photograph of an archictectural detail from the Meenakshi Sundareshvara temple, Madurai, Tamilnadu, is part of a collection entitled 'Photographic Views in Madurai ' (Madras, 1858) and was taken by Linnaeus Tripe in 1858. The Meenakshi Sundareshvara Temple is dedicated to Shiva and his consort Meenakshi, an ancient local divinity. The construction of this imposing temple-town was made possible by the magnificence of Tirumala Nayak (1623-1659). The rectangular precinct covers 6 hectares and has 11 huge towers and 4 entrance gopurams. Inside this enclosure there are columned mandapas, tanks, shrines and the two temples of Shiva and Meenakshi. East of the temple Tirumala Nayak began the construction of a new gopuram which was never completed. The most remarkable feature are 4 monolithic pillars. This view shows the base of one of the monoliths together with the elaborately carved pillars in the recessed north portico of the Raja Gopuram.